Turkish President Tayyip Erdogan speaks during a news conference in Istanbul, Turkey October 20, 2017. 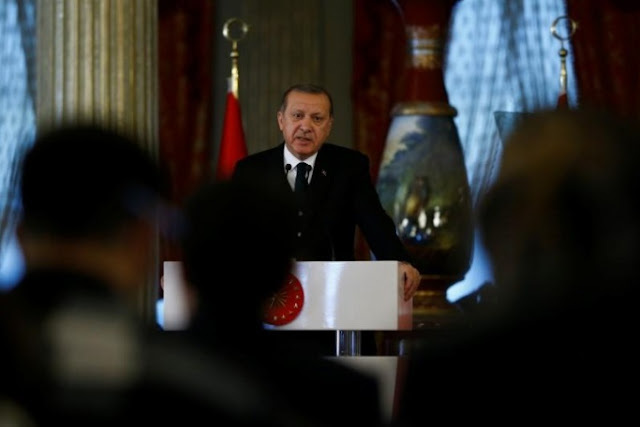 ISTANBUL/ANKARA - Turkish President Tayyip Erdogan showed no retreat from a diplomatic row with the United States on Saturday, castigating Washington for what he said an “undemocratic” indictment against his security detail. On Friday, Erdogan criticized the United States over a huge banner of jailed Kurdish militant leader Abdullah Ocalan unfurled in Syria’s Raqqa by U.S.-backed Kurdish forces. The banner was raised at a ceremony to mark Raqqa’s capture from Islamic State in a campaign spearheaded by the YPG. The PKK is considered a terrorist organization by the United States, Turkey and the European Union. Turkish President Tayyip Erdogan showed no retreat from a diplomatic row with the United States on Saturday, castigating Washington for what he said an “undemocratic” indictment against his security detail.